Background: Obesity is the worldwide epidemic and is characterized by excess adipose tissue. It contributes to numerous chronic diseases and early mortality. With urbanization and development there is reduction in physical activity. Objective: To find out the effectiveness of lumbar flexors and extensors muscle strengthening exercises on Waist-Hip Ratio in overweight adolescents. Study Design: Quasi experimental study design, pre and post type. Procedure: 34 subjects were conveniently selected based on Inclusion and Exclusion Criteria and randomly divided in to 2 groups. Group-A and Group-B. Each Group consists of 17 samples. Lumbar flexors and extensors strengthening exercises given to Group A and Group B free from strengthening exercises. Outcome Measures: Waist Circumference, Hip Circumference, Waist-Hip Ratio and Skin Fold Thickness at the abdomen. Results: Statistical analysis was done by using paired “t” test which showed more significant improvement in Group A. Conclusion: The study was concluded that Experimental group with exercise program showed statistical significant decrease in Waist Circumference, Hip Circumference and Skin Fold Thickness at the abdomen but no statistical significant reduction in Waist-Hip Ratio. Control group, who were not given any intervention showed increase in the waist circumference, hip circumference, waist- hip ratio and skin fold thickness at the abdomen. Overweight and obesity are defined as abnormal or excessive fat accumulation. Quality of life of individuals varies and it is influenced by life style, infrastructure, emotional and social wellbeing. People who are inactive are more likely to gain weight. To predict weight related risk, body mass index and Circumference of waist are most commonly used. Measurement of height, weight, circumferences and skin fold are used to estimate body composition. The technique involving the principle of skin fold measurement is that the amount of subcutaneous fat is proportional to the total amount of body fat and it is assumed that close to one third of total fat is located subcutaneously . Health is wealth, being healthy does not mean merely the absence of disease but also the maintenance of correct weight. A person with excessive weight is considered as unhealthy. Millions of people, male and female of every age are carrying excessive body weights on their bodies, According to Jerrold et al. there are about 50 million men and 60 million women between the age of 18-79 and 10%-20% of adolescents who were suffering from overweight and obesity are recognizable . Due to excess weight it may cause several health problems, including diabetes, heart diseases, hypertension, joint and muscle problems pulmonary dysfunctions and many others. Most of the physiotherapist neglect excess weight as a critical problem, which also needs attention. So it is necessary for physical therapist to assess and manage patients with excess weight to prevent clinical composition. People who possess excessive fat in their body are said to either obese or overweight . Thibodea and Kevin defined as obesity as an abnormal increase in the proportion of body fat. Most of the fat is stored in the subcutaneous tissue and around the viscera. Fat catabolism and yield energy and anabolize to form adipose tissue . Pollock and Hilmore defines overweight as the condition were an individual’s weight exceeds the population norm or average as determined on the basis of gender, weight and frame size. Obesity refers to be over-fat. Obesity can be treated by diet, physical activities, medications or surgery . According to Ruthsansford et al. obesity and overweight have serious medical implications. Thus, obesity and overweight are recognized by health professions as pre-disposing factors for its complication . Obesity is a worldwide epidemic and is characterized by excess adipose tissue. It contributes and early mortality. It is a disease characterized by excess body fat. The phenomenon is global and about 30 million Indians are obese. Obesity has reached epidemically in the 21st century, with morbid obesity affecting 5% of the Indian population. Obesity plays as a major risk factor for cardiovascular disease, by which the Indian Heart Association have been raising awareness about this issues, According to obesity index, india ranks third in the world, having selfdestruction of an individual due to increased eating of junk foods, consuming alcohol and change in sedentary life style, making one in every five Indian men and women either obese or overweight . Psychological factors are eating habits in response to negative emotions such as boredom, sadness, anger, where they may for binge eating behavior. Lack of physical activity are: Overweight and obesity is in large part caused by sedentary lifestyle. Scientific advancement in technology has led to the decrease in physical activity. Fitness is associated with increased basal metabolic rate, improved body composition, preserved lean body mass during weight loss, lowered insulin level, increased oxidative capacity of muscle tissue, larger amount of glycogen store in active muscles and increased sensitivity to fat-mobilizing hormones that decrease body fat . According to Indian statistics, about 10-20% of children in India are obese. This number increases to up to 30% among adolescents. About 2/3rd of children with obesity continue to be obese in adult life . Overweight in adult is categorized as body mass index of 23.99 to 25 and obesity as body mass index of more than 25.Overweight and obese were estimated to cause about 3 to 4 million deaths, loss of life of about 3.9 percent, and disability adjusted life years worldwide of about 3.8 percent. India is currently witnessing rising number of people in the middle-class who are obese. Most of the people in India has started showing interest on processed foods that contain a huge percentage of trans-fat, sugar, and other unhealthy and artificial Ingredients. Obesity is considered to be the main cause for many diseases. Increased weight carries many risks for some cancers, diabetes, heart diseases and stroke . In India, it is observed that about 20% of adults who were not overweight or obese as per the Body Mass Index definition still had abdominal obesity. Health risk is very high for young men when Waist-Hip Ratio is more than 0.95 and for young women when Waist-Hip Ratio is more than 0.86. As there is an increase in the awareness among the people about the various risk factors associated with obesity, many individuals are undergoing different weight reduction programs . Abdominal muscle weakness leads to increase lumbar lordosis and anterior pelvic tilt that results in mechanical low back pain which may persist as a chronic low back pain in adult life too. Lumbar lordosis and thoracic kyphosis, stretched abdominal muscles and tightened the hip flexors are few factors arises due to an anterior pelvic tilt. In order to maintain balance in a standing upright position with anterior pelvic tilt, the spine must be hyper-extended along with the lengthening of rectus abdominis and shortening of erector spinae muscles, associated with the lumbar lordosis. Lordosis can not only accompany with anterior pelvic tilt, but it can also balance the kyphotic spine in other different way, such as when the arms are supported, or when the hips drifted backwards (posterior femur tilt) or when enough hip flexion occurs . According to Harvard, core muscle function as a central link in chain connecting our upper and lower body. Training abdominal is a way to allow core to strengthen, body to improve its mobility and body movements to be carried away more efficiently and effectively. In Asian populations: abdominal or central obesity is more common than obesity defined by Body Mass Index. To evaluate the effectiveness of lumbar flexors and extensors muscle strengthening exercises on Waist Circumference, Hip Circumference, Waist Hip Ratio and skin folds at abdomen measurement in overweight adolescents. Abdominal muscle weakness leads to increase lumbar lordosis and anterior pelvic tilt that results in mechanical low back pain which may persist as a chronic low back pain in adult life too. So, as a preventive aspect this study aimed to prevent abdominal muscle weakness and anterior pelvic tilt. Study design was Quasi Experimental, pretest and posttest type. 34 subjects aged between 13-19 years, both males and females and Body Mass Index range between (22.99-24.99) were included. Exclusion criteria were individuals with recent spinal trauma, unhealed upper or lower limb fracture, low back pain with/without neurological symptoms and subjects who were undertaking any other forms of treatment for weight reduction were not included. 34 subjects were conveniently selected from SRM college of Physiotherapy, based on Inclusion and Exclusion Criteria and randomly divided in to two groups. Group-A and Group-B. Each group consists of 17 samples. Informed consent was obtained from subjects and Institutional Ethical Committee approval also got before starting the study. Lumbar flexors and extensors strengthening exercises given to Group A, and Group B free from strengthening exercises. Demographic data was collected. Waist and Hip circumference, Waist Hip Ratio and measurement of skin fold at the abdominals was measured using the skin fold caliper was taken before intervention. Subjects have to follow a set of exercise protocol for 30 days. After pretest assessment both lumbar flexors and extensor strengthening exercises were taught to Group-A subjects with respective rest period for 30 days. Day 3 3 leg raises, 3 crunches, 3 Russian twist, 3 heel twist, 3 modified v sits. Day 3 3 back extensions, 3 opposite arm/leg raises, 3 bridges, 3 cat camel exercise, 3 the dart. Day 5 5 leg raises, 5 crunches, 5 Russian twist, 5 heel twist, 5 modified v sits. Day 5 5 back extensions, opposite arm/leg raises, 5 bridges, 5 cat camel exercise, 5 the dart. Day 6 6 leg raises, 6 crunches, 6 Russian twist, 6 heel twist, 6 modified v sits. Day 6 6 back extensions, 6 opposite arm/leg raises, 6 bridges, 6 cat camel exercise, 6 the dart. Day 7 7 leg raises, 7 crunches, 7 Russian twist, 7 heel twist, 7 modified v sits. Day 7 7 back extensions, 7 opposite arm/leg raises, 7 bridges, 7 cat camel exercise, 7 the dart. Day 9 8 leg raises, 8 crunches, 8 Russian twist, 8 heel twist, 8 modified v sits. Day 9 8 back extensions, 8 opposite arm/leg raises, 8 bridges, 8 cat camel exercise, 8 the dart. Day 10 8 leg raises, 8 crunches, 8 Russian twist, 8 heel twist, 8 modified v sits. Day 10 8 back extensions, 8 opposite arm/leg raises, 8 bridges, 8 cat camel exercise, 8 the dart. Day 11 9 leg raises, 9 crunches, 9 Russian twist, 9 heel twist, 9 modified v sits. Day 11 9 back extensions, 9 opposite arm/leg raises, 9 bridges, 9 cat camel exercise, 9 the dart. Day 13 9 leg raises, 9 crunches, 9 Russian twist, 9 heel twist, 9 modified v sits. Day 13 9 back extensions, 9 opposite arm/leg raises, 9 bridges, 9 cat camel exercise, 9 the dart. Day 14 10 leg raises, 10 crunches, 10 Russian twist, 10 heel twist, 10 modified v sits. Day 14 10 back extensions, 10 opposite arm/leg raises, 10 bridges, 10 cat camel exercise, 10 the dart. Day 15 10 leg raises, 10 crunches, 10 Russian twist, 10 heel twist, 10 modified v sits. Day 15 10 back extensions, 10 opposite arm/leg raises, 10 bridges, 10 cat camel exercise, 10 the dart. Day 17 11 leg raises, 11 crunches, 11 Russian twist, 11 heel twist, 11 modified v sits. Day 17 11 back extensions, 11 opposite arm/leg raises, 11 bridges, 11 cat camel exercise, 11 the dart. Day 18 12 leg raises, 12 crunches, 12 Russian twist, 12 heel twist, 12 modified v sits. Day 18 12 back extensions, 12 opposite arm/leg raises, 12 bridges, 12 cat camel exercise, 12 the dart. Day 19 13 leg raises, 13 crunches, 13 Russian twist, 13 heel twist, 13 modified v sits. Day 19 13 back extensions, 13 opposite arm/leg raises, 13 bridges, 13 cat camel exercise, 13 the dart. Day 21 14 leg raises, 14 crunches, 14 Russian twist, 14 heel twist, 14 modified v sits. Day 21 14 back extensions, 14 opposite arm/leg raises, 14 bridges, 14 cat camel exercise, 14 the dart. Day 22 14 leg raises, 14 crunches, 14 Russian twist, 14 heel twist, 14 modified v sits. Day 22 14 back extensions, 14 opposite arm/leg raises, 14 bridges, 14 cat camel exercise, 14 the dart. Day 23 14 leg raises, 14 crunches, 14 Russian twist, 14 heel twist, 14 modified v sits. Day 23 14 back extensions, 14 opposite arm/leg raises, 14 bridges, 14 cat camel exercise, 14 the dart. Day 26 15 leg raises, 15 crunches, 15 Russian twist, 15 heel twist, 15 modified v sits. Day 26 15 back extensions, 15 opposite arm/leg raises, 15 bridges, 15 cat camel exercise, 15 the dart. Day 27 15 leg raises, 15 crunches, 15 Russian twist, 15 heel twist, 15 modified v sits. Day 27 15 back extensions, 15 opposite arm/leg raises, 15 bridges, 15 cat camel exercise, 15 the dart. Day 28 15 leg raises, 15 crunches, 15 Russian twist, 15 heel twist, 15 modified v sits. Day 28 15 back extensions, 15 opposite arm/leg raises, 15 bridges, 15 cat camel exercise, 15 the dart. Day 29 15 leg raises, 15 crunches, 15 Russian twist, 15 heel twist, 15 modified v sits. Day 29 15 back extensions, 15 opposite arm/leg raises, 15 bridges, 15 cat camel exercise, 5 the dart. Day 30 15 leg raises, 15 crunches, 15 Russian twist, 15 heel twist, 15 modified v sits. Day 30 15 back extensions, 15 opposite arm/leg raises, 15 bridges, 15 cat camel exercise, 15 the dart. The control group does not receive any intervention for period of 1 month. After 30 days of lumbar flexors and extensors strengthening exercises, post-test measurement was taken. In order to measure the Waist circumference, palpate the upper hip bone and the top of the right iliac crest. At the level of iliac crest, place a measuring tape horizontally around the abdomen. Before obtaining the reading from measuring tape, make sure that the tape is snugged well, without compressing the skin, and should be parallel to the floor. Hip circumference was measured by instructing the subjects to stand in erect posture with feet placing together, a horizontal measure should be taken at the maximal level of buttocks. Abdominal skin fold measurement can be taken with the tester, as it should pinch the skin at the appropriate site by raising a double layer of skin and the underlying adipose tissue on the right side without involving the muscle. The caliper must be applied 1cm below and right angles to the pinch, and a reading from the caliper should be taken within two seconds. Data were analyzed by using IBM SPSS version 20.0 software. Paired t-test and student independent test was applied to assess the Waist and Hip Circumference, Waist-Hip Ratio and Thickness of skin fold. According to Table 1 and Graph 1 the experimental group has shown a Waist Circumference decrease in mean value from 35.5294-33.9412 between pre and post-test. Hip Circumference decrease in mean value from 41.7059-40.1176 between pre and post-test and skin fold thickness at the abdominal decrease in mean value from 37.7059-36.0000 between pre and post-test. The table shows significant result increase in Waist and Hip Circumference and Thickness of Skin Fold at abdominal value between pre and post- test at p<0.001 level. Table 1: Pre and post-test within group-A. Graph 1: Pre and post-test within group-A. According to Table 2 and Graph 2 the experimental group has shown a Waist- Hip Ratio decrease in mean value from 0.8453- 0.8400 between pre and post-test. The table shows not significant result in Waist – Hip Ratio between pre and post- test at p<0.1 level. Table 2: Waist-hip ratio value for pre and post-test within group-A. Graph 2: Waist-hip ratio value for pre and post-test within group-A. According to Table 3 and Graph 3 the control group has shown a Waist Circumference increase in mean value from 36.6765-37.4353 between pre and post- test. Hip Circumference increase in mean value from 41.6471-42.0941 between pre and post-test. Skin fold thickness at the abdominal increase in mean value from 43.0588-43.6412 between pre and post-test. The table shows significant result in Waist and Hip Circumference and Thickness of Skin Fold at abdominal value between pre and post- test at p<0.001 level. Table 3: Pre and post- test within group-B. Graph 3: Pre and post- test within group-B. According to Table 4 and Graph 4 the control group has shown a Waist- Hip Ratio increase in mean value from 0.8706 to 0.8800 between pre and post-test. The table shows significant result increase in Waist-Hip Ratio value between pre and post- test at p<0.001 level. Table 4: Waist-hip ratio value for pre and post- test within group-B. 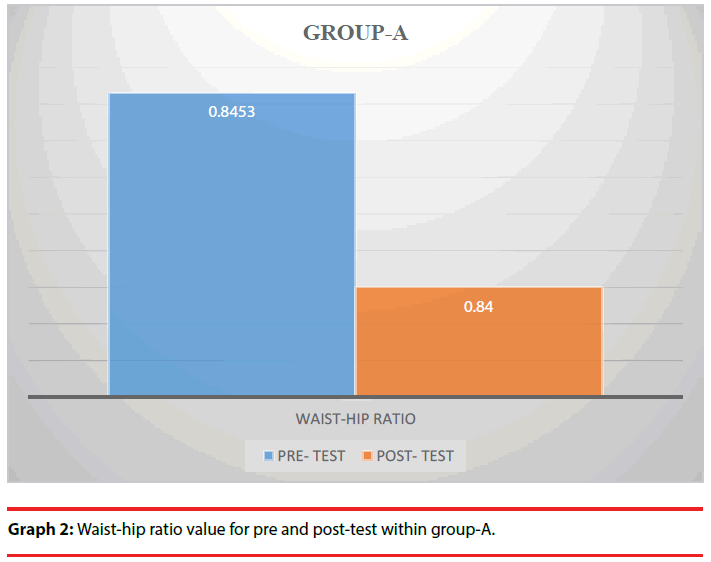 Graph: Waist-hip ratio value for pre and post- test within group-B. According to Table 5 and Graph 5 overweight individuals showed decrease in Waist and Hip Circumference, Waist- Hip Ratio and Skin Fold Thickness in Group-A and Group-B showed increase in in Waist and Hip Circumference, Waist- Hip Ratio and Thickness of skin fold. Table 5: Comparison of post-test values between group-a and group-B. Graph 5: Comparison of post-test difference between group-A and group-B. The objective of the study was to find out the effectiveness of abdominal exercises which include isometric exercises, Leg raise, Crunches, Heel touch, Modified v sits, Russian twist for flexor muscle group and Back exercises which include Back extensions, Opposite arm/ leg raises, Bridges, Cat-camel exercises, The Dart for extensor muscle group on Waist and Hip Circumference, Waist-Hip Ratio and Thickness of Skin Fold at the subjects) with exercise program showed statistical significant decrease in Waist and abdomen in overweight adolescents. The statistical results have shown that Experimental group (17Hip Circumference and Thickness of skin fold at the abdomen but no statistical significant reduction in Waist-Hip Ratio. Control group (17 subjects),who were not given any intervention showed increase in the Waist and Hip Circumference, Waist-Hip Ratio and Thickness of skin fold at the abdomen. According to the statistical results, the experimental group has shown a waist circumference decrease in mean value from 35.5294-33.9412 between pre and post-test. 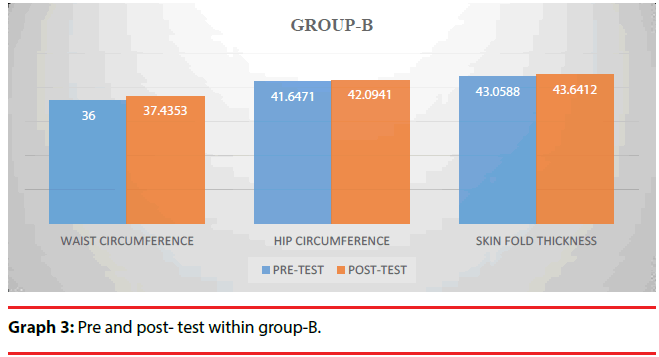 Hip circumference decrease in mean value from 41.7059-40.1176 between pre and post-test and skin fold thickness at the abdominal decrease in mean value from 37.7059-36.0000 between pretest and post-test. The table shows significant result increase in Waist and Hip Circumference and Thickness of Skin Fold at abdominal value between pre and post- test at p<0.001 level. Not significant result in Waist-Hip Ratio between pre and post-test at p<0.1 level. The control group has shown a waist circumference increase in mean value from 36.6765-37.4353 between pre and post- test. Hip circumference increase in mean value from 41.6471-42.0941 between pre and post-test. Skin fold thickness at the abdominal increase in mean value from 43.0588-43.6412 between pre and post-test and Waist- Hip Ratio increase in mean value from 0.8706-0.8800 between pre and post-test. The table shows significant result in Waist and Hip Circumference, Waist-Hip Ratio and Thickness of skin fold at abdominal value between pre-test and post- test at p<0.001 level. Several studies have shown that exercise induced relative loss of fat seems to be higher in the abdominal region, arms and thigh region in obese individuals. Gidding et al. concluded that poor fitness in young adults in associated with the development of cardiovascular risk factors. Tremblay and Despres concluded that the waisthip ratio remained significantly lower in subjects performing high-intensity exercises. Martinez- Gomez et al. said that adolescents who were involved in resistance training had significantly higher muscle fitness scores compare with youth in low and medium tertile of vigorous physical activity. In this study, Core muscles were concentrated and Exercise programs were performed for weight loss by reducing energy expenditure which also increases the strength and endurance of the abdominal muscles. Many studies has been shown that exercise training is more effective to get rid of abdominal fat as it reduces stress and insulin levels, which reduces the presence of cortisol, a hormone that leads to more belly fat deposits. Evidence from studies shows that manipulating free fatty acids (FFA) are important because the number of metabolic abnormalities in overweight individuals are caused by elevated free fatty acids. Free fatty acids released from visceral fat make a minor contribution by affecting muscle, pancreatic beta cells and vascular endothelium. Omental and mesenteric fat may cause problem by delivering both excess free fatty acids and IL-6 in person with overweight. Hence Exercise can improve in regulating the free fatty acids metabolism. The role of core muscles are to stabilize the spine and core muscle training is important in increasing functional predispositions of physical activity. This particularly involves improving intra and inter muscular coordination or synchronization of participating muscles. Vijay et al. concluded that moderate amount of physical activity is significantly associated with a more favorable biochemical profile in terms of lipid circulating levels with respect to both absent and intense categories. Jaimie et al. concluded that subjects who received the combination of aerobic and strengthening exercise training achieved better cardiovascular gains (VO2 MAX) thereby, losing more amount fat when measured by Dual-Energy X-Ray . Watts (2004) revealed that an 8 week crossover combination of aerobic and strength training intervention three time in a week that resulted decrease trunk and abdominal fat as measured by Dual Energy X-Ray in obese adolescents . Leo stated that exercise intervention leads to moderate decrease in Body Mass Index, mild decrease in waist circumference and body fat and a better improvement in lean tissue mass. Some evidence suggested that exercise can decreased systolic blood pressure moderately, and also moderately improves in glucose handling, with improved insulin sensitivity . Lambrick revealed that exercise intervention or combination of exercise along with other modification in lifestyle can resulted in 3.7 kg decreased in body weight. Exercise plays an important role in maintaining the cardio metabolic health beyond maintenance of body weight or Body Mass Index . Thus this study concluded that Overweight individuals showed decrease in Waist Circumference, Hip Circumference and Skin Fold Thickness at the abdomen with exercise intervention and control group showed increase in Waist Circumference, Hip Circumference, Waist- Hip Ratio and Skin Fold Thickness. In this study there was not much difference in Waist-Hip Ratio according to the statistical analysis may be due to short duration of the study. It may differ if this study will carried out in longer duration and with larger sample size. The study was concluded that Experimental group with exercise program showed statistical significant decrease in Waist and Hip Circumference and Thickness of skin fold at the abdomen but no statistical significant reduction in Waist-Hip Ratio. Control group who were not given any intervention showed increase in the Waist and Hip Circumference, Waist- Hip Ratio and Thickness of skin fold at the abdomen. The limitations of the study were, subjects more than 19 years of age were not included, Daily dietary intake was not checked and gender distribution in both the groups was unequal. Future studies on comparison of these exercises on Body Mass Index and weight of an individual could be done. Objective outcomes like ultrasonography and EMG could also be used and long duration of the study can be done. Silvia CD. Effect of 30 days abdominal challenge versus 30 days planks challenge on waist circumference and abdominal skin fold measurement in healthy young individuals: randomized Clinical Trail Physiother. Res. Int 4(3), 524-29 (2016). Jerrold SG, Dintiman GB, Oakes BM, et al. Physical fitness and wellness (2nd Edtn) Bejamin Cummingd 6, 345 (1997). Hockey RV. Physical fitness: The pathway to health to healthful living. McGraw-Hill Humanities/Social Science/Languages. (8th Edtn) 320 (1996). Gray AT, Pantton K. The human body in health and disease (9th Edtn) Luppincott Williams and Winkis, 832 (2001). Pollack MC, Wilmore JH. Exercise in health and disease (2nd Edtn) WB Saunders 967 (1984). Savsfore R, Joaune A, Saxton B, et al. (1997) Women’s health, a textbook of physical therapist. Bejamin-cummings 543-546. Thompson WR, Gordon NF. ACSM’s guidelines for exercise testing and prescription. 8th Edtn. 74 (2009). Luckmann J. Youth health. Prentice Hall College. 234,467 (1990). Kumar D. Is your child obese? Indian Health Care and Fitness Bolg. 17 (2015). Tomlison DJ, Erskine RM, Winwood K, et al. The Impact of obesity on skeletal muscle strength and structure through adolescence to old. Biogerontology 17(3), 443-445 (2016). Thompson WR, Gordon NF. ACSM’S guidelines for exercise testing and prescription. 58(3), 71-77 (2009). Levangie PK, Norkin CC. Joint Structure and Function a Comprehensive Analysis (4th Edtn) 369-371. Byrne N, Hunter G, Meerkin J, et al. Combining resistance and aerobic training results in greater body composition and fitness benefits than either mode separately. Obese. Res (2005). Watts K, Beye P, Siafarikas A, et al. Exercise training normalizes vascular dysfuction and improves central adiposity in obese adolescents. J Am. Coll. Card 43(10),1823-1827 (2004). Roberts CK, Lee MM, Katiraie M et al. Strength fitness and body fat status on markers of cardio metabolic health. Med science sports exercise. Med. Sci. Sports Exerc 47(6), 341-350 (2011). Lambrick DM, Stoner L, Faulkner J, et al. Preventive medicine needs to begin with our children. Int. J. Prev. Med 129-133 (2014).